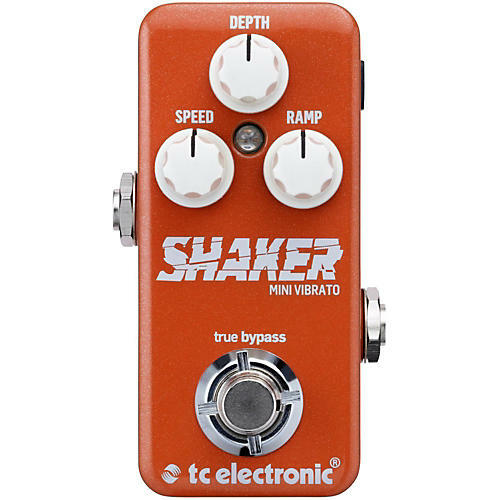 The original Shaker Vibrato has been the sleeper hit of the TonePrint series. Guitarists love adding the life and vibe of both subtle and pronounced vibrato effects - and rightly so! From classic Leslie-type tones and cool Mellotron vibes through the fragile "Lucy In The Sky With Diamonds"-type sounds or a modern ˜bottom of the ocean' swirl, Shaker Mini Vibrato delivers in a pedal so small, there's no excuse to not add it to your board! Size matters in all aspects of life. More volume is better than less and 2 guitars are better than one. But when it comes to pedals, a tiny form factor combined with a great sound is the clear winner for guitarists - so that's what they've provided! Shaker Mini Vibrato is TonePrint enabled. This means you get the revered TC sound multiplied to infinity with rockstar-customized versions of the best vibrato sounds known to guitarkind- free of charge! From a subtle warble to Leslie sounds, Shaker Mini Vibrato does what it can to liven things up! From the killer stock sound to an endless world of TonePrints, you're got everything you need to add some subtle vibes or kick up a storm! TonePrint enabled - load Shaker Mini Vibrato with your favorite artist's tone. Free TonePrint Editor to create your own custom vibrato pedal. Beam enabled - send TonePrints to Shaker Mini through their free TonePrint for iPhone and Android.